Out of all of Sea Gem's rooms, our galley is probably the most house-like. While most boats' galleys have miniature versions of familiar kitchen appliances (a 2 burner gas stove, a tiny oven, etc. ), Sea Gem's galley is equipped with house-sized appliances. Well, sort of. Take our stove for instance. Our 26-inch, 4-burner electric stove was likely standard-sized in the 80's, but compared to the 30-inch (or more) stoves found in stores today, it is hardly standard anymore. I love our stove. For starters, it is electric. While I realize that most people dream of having a massive gas range in their kitchen, I, for one, do not. In fact, a gas stove ranks #1 on my list of stuff I don't want. Yes, they are nice to look at, and I know nothing is better to cook with, but the horrible ticking sound they make when you turn them on sounds like a bomb about to explode, and the anxiety this causes me is something I'd rather not deal with on a daily basis (or ever). In addition to our stove's non-explosive nature, it also has a rich history, which makes me appreciate it even more. 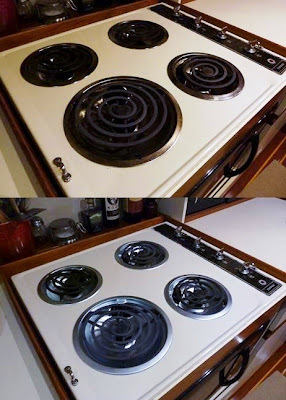 While it is true that only 3 of our stove's 4 burners function, I'd say its only real downside is that it's a bit dated looking, which isn't doing our galley any favors in the design department. The Golden Girls would be proud. When the time comes to replace the stove, consider an induction model. Yes, you must have pots and pans that are made from conductive metal ie not copper or aluminum bottoms but there many to choose from these days if you don't have them already. Your child will not burn herself on a hot burner because the burner does not get hot only the pot. Many cruisers are heading in that direction because the energy loss is less. But what about getting the baby off the boat?